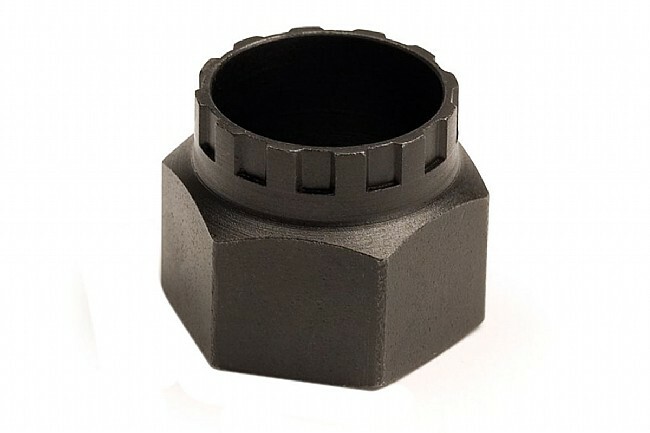 Precision cut to fit Campagnolo bottom bracket and cassette lockring* splines. For removal of Campagnolo Record, Chorus and Athena cartridge bottom brackets and all Campagnolo cassette lockrings. *A chain whip is also required for cassette removal. Crude, doesn't fit precisely, have to pound it in. If you're removing cassettes more than once every couple of years, spring for the Campagnolo-made tool. This doesn't fit the retaining ring precisely and I have to bang it in. Not what I want to do with Campy 10, Record and Super Record cassettes. Since I change out cassettes for training, racing, the terrain, to replace worn gears, etc. I'll have to buy the (much more expensive) Campy-made tool. The one I have fits Campy rings (I have several Campy ringscassettes) very crudely ... I have to bang it in place with a rubber mallet, then pry it out with an open end wrench between the ring and tool. Perhaps I just got a poorly finished one. I hate doing this to a Campy ring. I'll have to spring for an (expensive) Campagnono precision made tool. When you need a tool, buy it! I was moving groups between bikes and needed this tool. For a small outlay, I will never need this again.